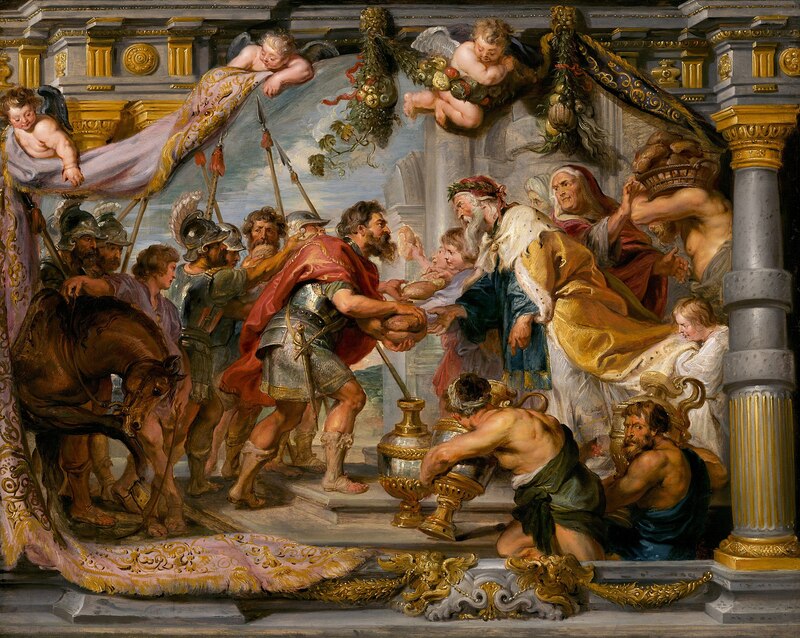 As indicated in the title, The Meeting of Abraham and Melchizedek by Peter Paul Rubens is exactly that...plus a little wink wink nudge nudge between Abraham and Melchizedek that no one else in the painting picks up on. This wink wink nudge nudge is that “the bread and the wine have significance beyond bodily sustenance.” Wait…what? This is a scene from the Old Testament, and if you’ve ever seen any Roman Catholic art, I’m sure you’ve seen how obsessed everyone is with bread and wine. Well, the reason for this is that Catholics believe that when blessed by a priest, bread and wine transform into the body and blood of Christ in a process called transubstantiation. The ceremony in which the bread and wine are consumed is called the Eucharist, a tradition which stems from Christ's words during the Last Supper in the New Testament. So Melchizedek (aka the Priest-King of Salem) here is some kind of Jesus foreshadowing, and the bread and the wine that he is handing over to Abraham is some kind of Last Supper foreshadowing. Abraham was deserving of these gifts because he had just fought a victorious battle and was obviously starving and parched. If you look closely, this artwork is actually a painting of a tapestry held up by cherubs. So meta. This type of biblical interpretation in which Old Testament stories are read as having been shaped by God to prefigure Christ is known as typology, a theory that has been around since the Early Church and one that allows artists to max out the symbolism in their paintings. Peter Paul Rubens tried so hard on this particular painting because it was commissioned by the Infanta Isabel Clara Eugenia, Governess of the Southern Netherlands. He was asked to create a series of tapestries that represented The Triumph of the Eucharist to be hung in the convent of the Poor Clares in Madrid. Of all the convents, the Poor Clares was definitely the most devoted to the Eucharist and thus deserving of this amazing commission. And they were super grateful because it was right up their alley.